We didn’t really mean this to become the exhaustive examination it has ultimately become, but PM 86 will go down in history as the first and authoritative listing of one of Marx’ least examined lines, the “Header Bag” sets. It has brought some of the heavy hitters up onto the PM deck, and this is an elite group since the Header Bag isn’t the easiest or most common item in the Marx line to collect. What is a header bag, you ask? A bag with a cardboard “header” (retailers call them ‘hangar cards,’ since there is usually a small hole so the item can be hung from a peg on the wall or a rotating spinner. Inside the bag, which is usually about twice as long as it is wide, is a specialized assortment of figures and sometimes accessories. They must have been made by a slightly different crew, or at the “other end of the factory,’ since they contain in many cases very rare Marx items. But in general, they would hold a mold shot or two of figures – say, Indians, cowboys, or a set of Civil War figures, something like that. Then to “up the piece count” as Frank Rice used to explain, they added the small weapons accessory sprues, or something else, to make the price more attractive. The price was usually around .69 to .99 cents. These were shipped by the dozen to the retailers and distributors, often as part of an assortment, where they became staples of Woolworth’s and other dime stores, toy stores, and the like. The problem was they were so doggone attractive that the bag was most often immediately ripped open and figures and everything else dumped out for play. The point being, very few survived. That’s where the fun comes in. A few collectors – Jim McGough, Ed Sponzilli, Dave Schaffer, Rick Eber, Dave Foley, have preserved this incredible heritage, and even provided photographs for examination, in great detail. But they are not easy nor inexpensive to come by, and the images in this article represent years and years of searching and collecting. Also this issue is the exciting expose by Marc Gaynes, “How I Led the Foreign Legion in a Battle and lived to tell about it!” This weird tale reads like battle-born sci fi, involving miniaturization, minime’s, a wife, and makers from Barzso, Conte, Reamsa, Britains and others. It is unusual and entertaining in the extreme, with lots of battle shots taken during the action. I know, cool, right? 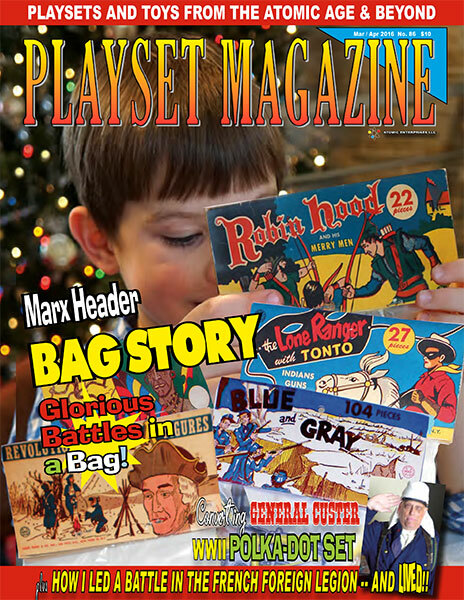 Jim MGough weighs in with a story about the mysteries of the header bags, and Rick Eber introduces readers to another of Marx’ figure marketing efforts, the so-called polka dot box sets. Featured this time are the “WWII Army and Accessories” set.